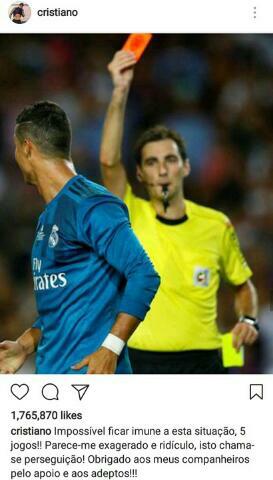 Ronaldo Reacts to five matches ban given to him,say it is "Ridiculous"
Cristiano Ronaldo React To Five Matches Ban Given To Him, Says It Is "Ridiculous"
The Real Madrid star has hit out at the sanction, which was issued after he laid his hands on a match official against Barcelona. The world football star took to his instagram page to react to the ban. "Impossible to be immune to this situation, 5 games !! It seems to me exaggerated and ridiculous, this is called persecution! Thanks to my teammates for the support and the fans" !! !